Vertical sleeve gastrectomy (VSG) effectively reduces body weight (BW) in obese rats and humans. However, post-surgical weight regain is frequently observed in subjects after VSG, but the underlying reasons remain poorly understood. We therefore investigated if post-surgical consumption of different diets can affect the outcome of VSG. VSG or sham operation was performed in Long–Evans rats with diet-induced obesity (n = 37). After post-surgical recovery, rats were fed ad libitum either with standard chow (CH), high-fat (HF) or low-carbohydrate, high-fat (LCHF) diets. BW and food intake were measured every second day; serum leptin, cholesterol, HDL cholesterol, and triglycerides were analyzed 4 weeks after surgery. Energy expenditure and locomotor activity were determined by a combined indirect calorimetry system, lean and fat mass by nuclear magnetic resonance. After 4 weeks, BW gain, fat mass, and leptin were lower in VSG rats when compared to sham controls (p < 0.05). 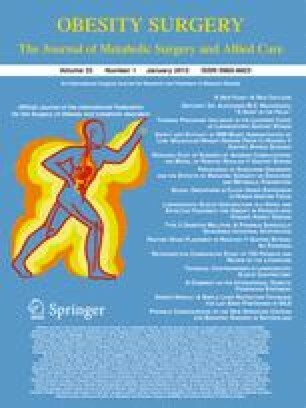 Energy expenditure and locomotor activity were not affected by VSG indicating that weight reduction derives from the significantly lower cumulative 4-week energy intake in VSG compared to sham. Sham rats fed LCHF consumed the most energy, followed by rats fed HF. In contrast, after VSG cumulative energy intake was highest in rats fed HF, but not different between CH and LCHF. Consistently, post-surgical BW and fat mass regain were highest in the HF-VSG group. Lipid profiles were improved by VSG but not differentially affected by diets. In conclusion, consumption of a HF diet but not the more energy-dense LCHF diet reduced the effectiveness of VSG in rats. Maximilian Bielohuby and Kerstin Stemmer contributed equally to this work. All authors have nothing to disclose. RJS serves as a paid consultant and speaker on the behalf of Ethicon Endo-Surgery. This work was supported by Ethicon Endo-Surgery and the “Deutsche Forschungsgemeinschaft” [DFG (Ste1466/4-1)].